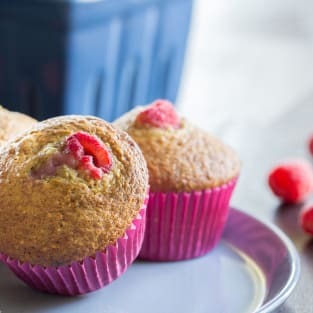 Preheat oven to 400 and prepare a muffin tin with nonstick spray or paper liners. Mix together flours, oat bran, baking soda, baking powder, and salt, and set aside. In a large bowl, mix together brown sugar, honey, and eggs, until eggs are beaten and everything is incorporated well. Stir in the half-and-half. Stir in the dry ingredients until fully incorporated. Fold in raspberries, gently if you care about preserving the shape of the berry. Divided batter among 12 muffin cups and bake for about 15 minutes. You may add 2 tablespoons King Arthur Flour cake enhancer to improve texture.